Department of Chemical Engineering, Cape Peninsula University of Technology, Cape Town 8001, South Africa. 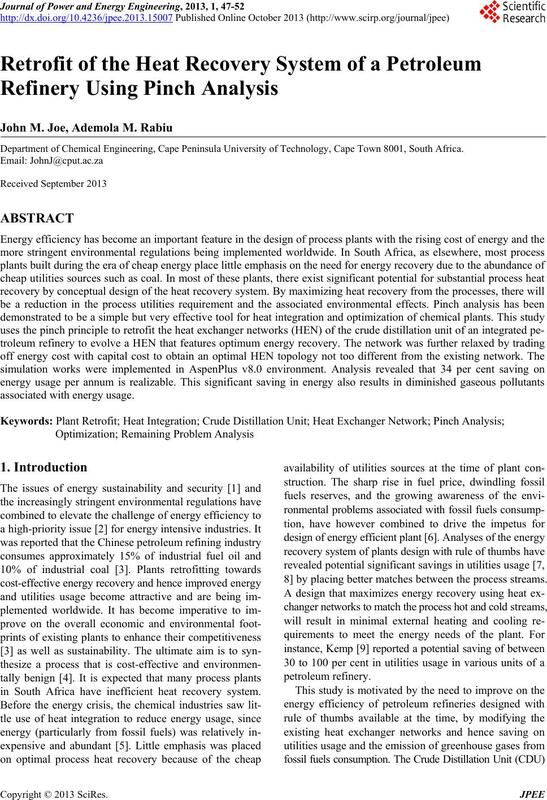 in South Africa have inefficient heat recovery system. 8] by placing better matches between the process streams. as much as 2 per cent of the total crude oil processed . the heat exchangers that are inefficiently placed. maximum energy recovery possible at the chosen ∆Tmin..
sis approach as developed by Tjoe and Linnhoff . not be markedly different from the existing networks. 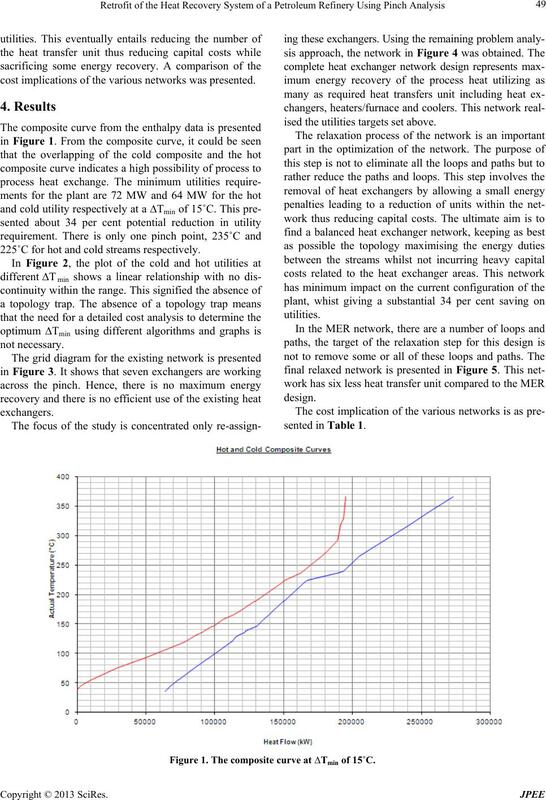 cost implications of the various networks was presented. 225˚C for hot and cold streams respectively. ised the utilities targets set abov e.
Figure 1. The composite curve at ∆Tmin of 15˚C. Figure 2. Plot of the utility requirements vs ∆Tmin. Figure 3. 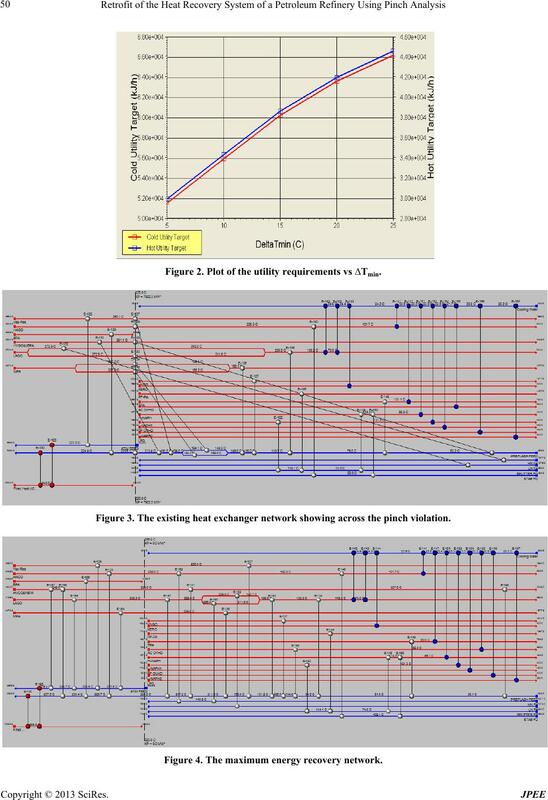 The existing heat exchanger network showing across the pinch violation. Figure 4. 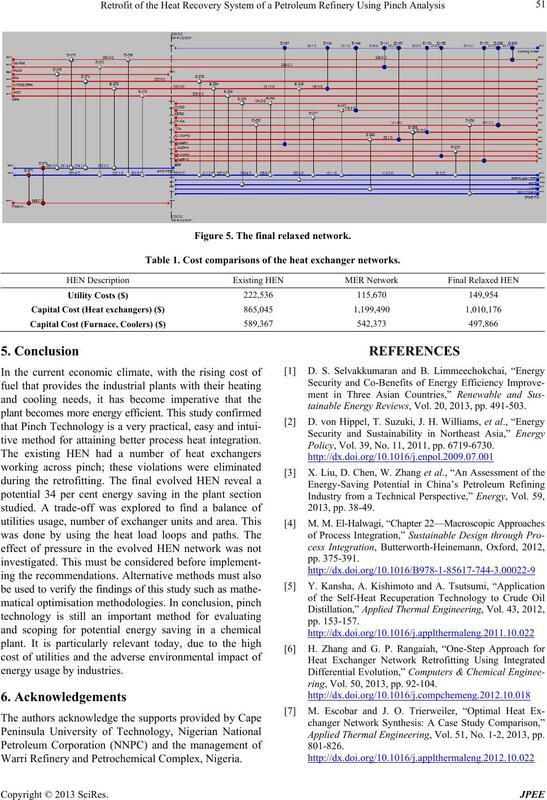 The maximum energy recovery network. Figure 5. The final relaxed network. Table 1. Cost comparisons of the heat exchanger networks. 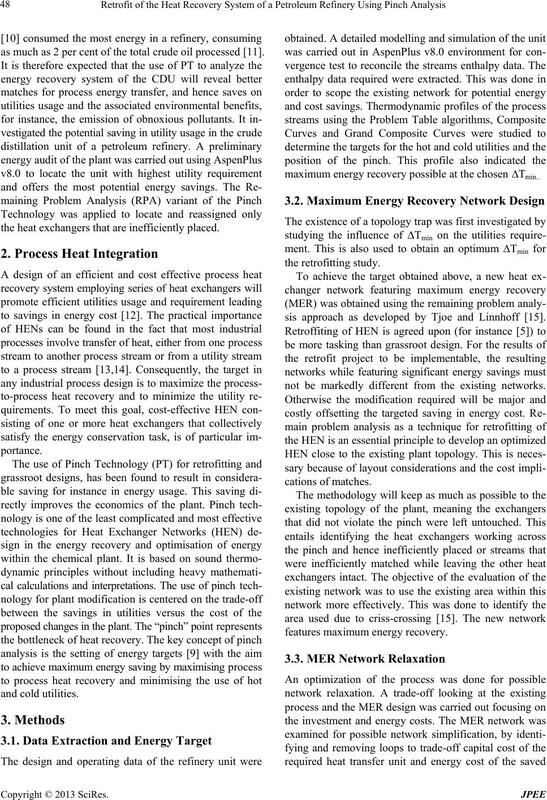 tive method for attaining better process heat integration. Warri Refinery and Petrochemical Complex, Nigeria. tainable Energy Reviews, Vol. 20, 2013, pp. 491-503. Policy, Vol. 39, No. 11, 2011, pp. 6719-6730.
ring, Vol. 50, 2013, pp. 92-104. 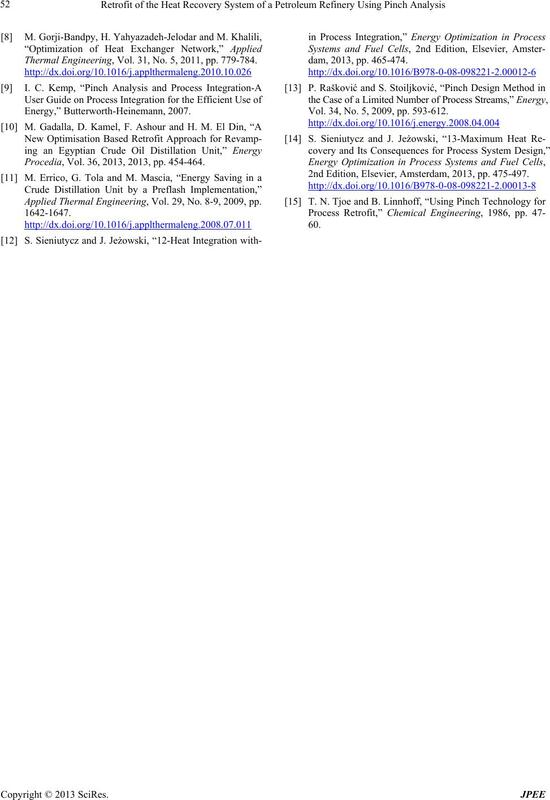 Applied Thermal Engineering, Vol. 51, No. 1-2, 2013, pp. Thermal Engineering, Vol. 31, No. 5, 2011, pp. 779-784. Procedia, Vol. 36, 2013, 2013, pp. 454-464. Applied Thermal Engineering, Vol. 29, No. 8-9, 2009, pp. Vol. 34, No. 5, 2009, pp. 593-612. 2nd Edition, Elsevier, Amsterdam, 2013, pp. 475-497.